What’s up with the Granola giveaway? This past week, during yoga classes at Yoga in the Heights, we handed out little packs of homemade granola to the first 10 students who arrived to the pop-up yoga space at 346 Central Avenue. Every week we are at the pop-up location, Yoga in the Heights will be giving away a new ‘gift’ to our yoga students as an offering of gratitude and appreciation for your presence in and contribution to our yoga community in Jersey City Heights. It’s also a just another way we want to make this transition period fun! The granola this week was made by Bridget Fujioka. Check out her recipe below! Instead of buying a box of expensive granola at Whole Foods for $5.99 I decided to make my own. What is so easy about this recipe is you can use whatever you have available in your fridge or pantry. I love to eat granola as a quick on-the-go snack for myself and my son. My toddler definitely makes a mess eating it so don’t be surprised if you are forever finding pieces in the back seat of your car. Below is the recipe, and I included the ingredients I used for those of you who got to taste some of the deliciousness of this week’s give away. Preheat oven to 325 degrees. Line a large rimmed baking sheet with parchment paper. Combine all ingredients in a large bowl and stir well to combine. Spread on parchment paper lined baking sheet. Bake in preheated oven for 10 minutes. Stir. Bake an additional 10-15 minutes, watching closely so it doesn’t burn. Let cool, and then stir in an airtight container. 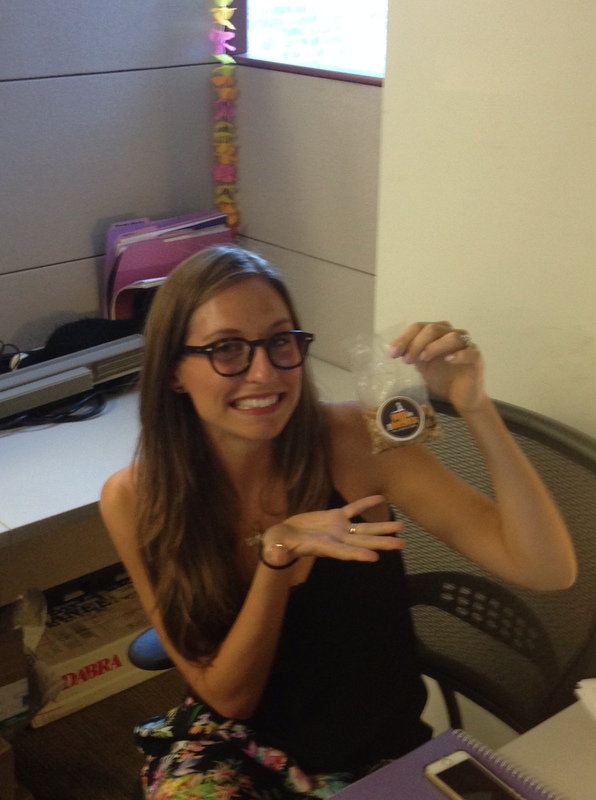 Lindsey, one of our Yoga teachers, snacking on Bridget’s granola while at her day job. Please take our Survey for our new Jersey City Heights Yoga studio location!